At F&S, our Purpose is to generate solutions to achieve success for our clients. In this regard, our approach to monthly accounting services must go beyond the current standards of the industry. Instead of a transactional relation whereas the accountant is dedicated to update the accounting platform and issuing timely financials, at F&S we aim at generating value through active collaboration and thorough analysis involving our key areas: Accounting, Taxes, Strategy and Internal Processes. 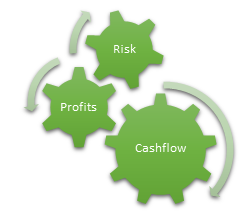 Every month, prior submission of the financial statements of your company, the Board of Advisors will review the case to identified opportunities of value in three key areas: Cashflow Optimization, Increase of Profitability and Risk Reduction.